Commandant of the Cadet Force, Major Dwight Lewis made this announcement during his address at the Cadet Force Awards and Promotion Parade that was held last Saturday at the Old Montrose Police Station. The camp will include cadets from Antigua and Barbuda, Barbados, St. Kitts and Nevis, Belize, Canada, Cayman Island, Bermuda, Dominica, Jamaica, St. Lucia, Trinidad and Tobago and United Kingdom. 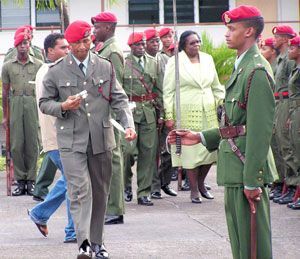 âInternational Camp 2008 will be a successful venture having received the full support and backing of the Prime Minister and the Government,â Lewis stated. Minister of Education, Giryln Miguel expressed her satisfaction with the organization for their achievements over the years and said this it is the second time that this country will be hosting the event, as the first camp as was held in 1996 at North Union.